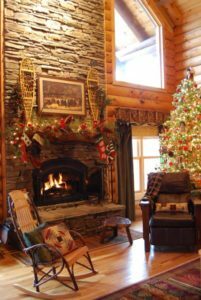 Decorating Your Log Home for the Holidays! 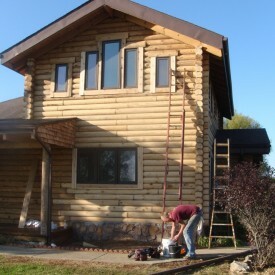 Home » Our Blog » Holidays » Decorating Your Log Home for the Holidays! 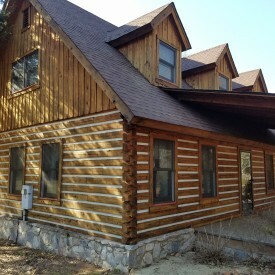 Log cabins hold a very special part in history and in the hearts of those that admire them. 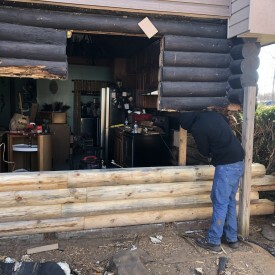 The first log cabins were constructed of rough-hewed local timber, they typically consisted of one room with a fireplace and sleeping loft. 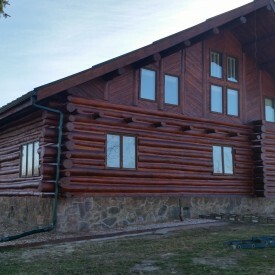 The log cabin has greatly evolved into beautiful and often luxurious homes. 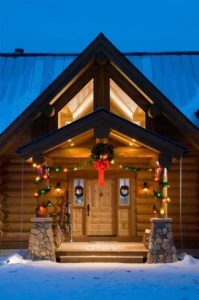 Regardless of the design or size of your log home or cabin, when decorating for the Christmas holiday, simple or grandly, it should always be done with respect to its inherent, natural charms. 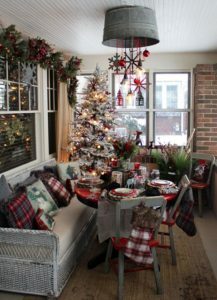 STEP 1: Set the mood with your favorite Holiday music and a glass of eggnog or cider perhaps! 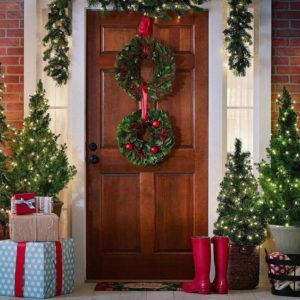 Christmas cheer can be big and bold or relaxed and simple. 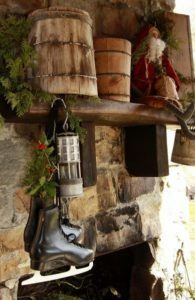 For big, bold and luxurious design schemes, decorate the cabin’s eaves with white twinkle lights rated for outdoor use. For simple and rustic design schemes, use a combination of found and purchased items. Consider decorating each window with a flameless candle in an appropriately sized mason jar. Should the candle be too large for a jar, display it on a vintage dessert plate. Add country charm and decorate either the jar or plate with artificial berries. 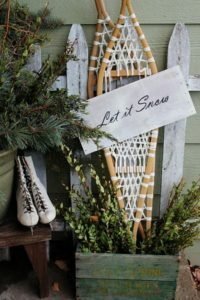 Decorate the area near the front door either with festive elements such as lit pine garland, pots of poinsettias, small pine trees, vintage barrels, ski shoes or ice skates… Get creative! 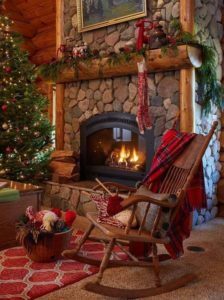 While the Christmas tree is the cornerstone of any Christmas decorating scheme, it should enhance the rustic walls of the cabin. 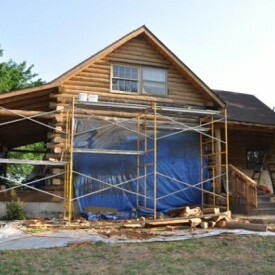 The character of the cabin’s rough walls supply a natural charm year-round, and the tree shouldn’t compete. 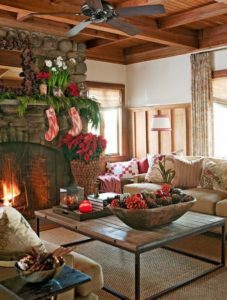 If your style is grand and luxurious, seek a real or artificial tree that gracefully brushes against the exposed ceiling beams and whose fullness nearly occupies one corner of the room. Decorate the tree with layers of ornaments and velvet garlands. 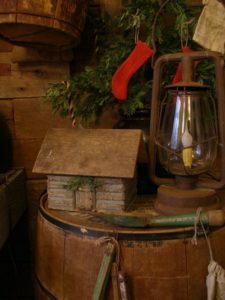 A rustic tree can be a small and sparse pine adorned with homemade ornaments and a simple burlap garland or as sparse as pieces of driftwood artfully arranged to resemble a tree. 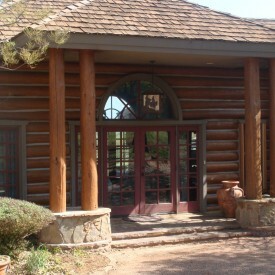 A traditional log cabin has a fireplace used to provide heat and prepare some of the meals. Hang the stockings, made of plush velvet or plain linen, from the mantel with care. 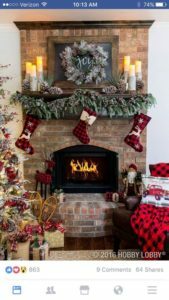 If the fireplace is working, keep the stockings elsewhere until Christmas night. Hanging the stockings from the exposed pegs in the walls will keep them safe from the fire. Decorations need not be limited to the living room alone. 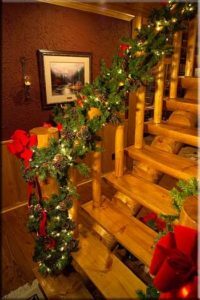 You can add festive touches throughout the cabin. Simple changes include swapping everyday kitchen and bath towels for Christmas-themed towels in shades of red and green. 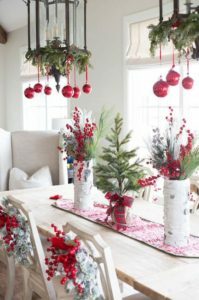 Enhance the natural beauty of the log walls with natural elements such as highlighting a wooden shelf with pomegranates on a bed of holiday greenery or using the wall’s wooden pegs as a hanger for a balsam wreath simply decorated with Christmas-themed cookie cutters held in place with twine. Holiday throw pillows made of burlap and adorned with pictures of reindeer or doves and words such as “Joy” and “Peace” add cheer and comfort to an easy chair or couch. Don’t forget the stair banister, lots of opportunity here. Your dining room table offers a great opportunity to be creative! A centerpiece should be your focal piece of décor, Christmas candles, a small pine and some color to brighten it up. From there you can add holiday dishware, linens and much more! Happy Decorating and cheers to you all for a beautiful holiday season!